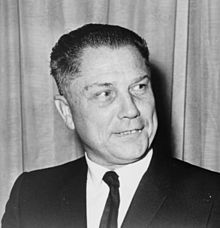 James Riddle Hoffa, lesanvet Jimmy Hoffa, ganet d'ar 14 a viz C'hwevrer 1913 ha steuziet d'an 30 a viz Gouhere 1975, a voe penn uhelañ an unaniezh labourerien International Brotherhood of Teamsters (IBT) etre 1958 ha 1971. Steuziañ a reas e fin miz Gouhere 1975, d'an oad a 62 vloaz. Kemmoù diwezhañ degaset d'ar bajenn-mañ d'an 6 Meu 2017, da 21:53.